Many children naturally take to water without any fear; however, there are also many children who tend to be rather cautious about their exposure to an aquatic environment. It is natural for these kids to enter the water by first just dipping their toes and holding on to something that is secure. When children begin to learn to swim, it takes time for them to overcome the fear of not being able to touch the bottom of the pool like they do on land. The challenge for swim schools is how to build up the children’s confidence and overcome their fear of water. 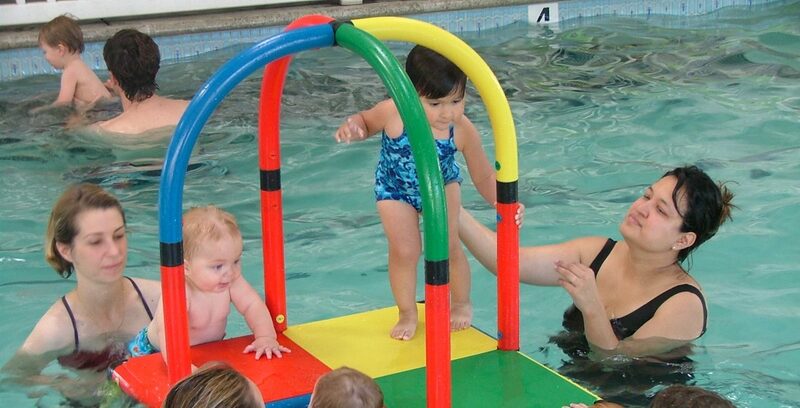 PoolDocks Portable Swim Training Pool Platforms are an excellent training aid for swim instructors to help toddlers and beginner swimmers to feel at ease and secure in the water. The platforms are like an “island” in the middle of the pool that kids will consider the same as being on the sides of the pool. Depending on the depth of the water and height of the platform, the kids may be able to sit on the side of the PoolDocks platform and put their feet in the water, or the top of the platform may be just under the surface so the kids stand in a few inches of water. The platforms are available with and without side railings depending on the needs and teaching methods of the swim school. PoolDocks pool bench platforms for tot and toddler are very safe and should be used in swim training classes to teach tots and toddlers children how build confidence, overcome fear of water develop into strong swimmers. As they learn how to swim with confidence, the children will better enjoy the fun they can have safely swimming in all types of aquatics venues such as pools, water parks, lakes and rivers. In addition, not only will they benefit from learning about water safety, but some of these children will go on to be competitive swimmers – even perhaps advance as far as the Olympics. Many of the designs created by PoolDocks vary in height, capacity, and shape. They are based on the suggestions received from expert swim school instructors from around the world. The PoolDocks structures are designed primarily for use by young children weighing up to 110 lbs. The pool platforms are not designed for heavier children, adults or aggressive play. PoolDocks pool platforms are safe, compact, lightweight, portable, and durable. The structures are based on a modular construction system developed by Quadro™. All the components are colorful, rugged, and long lasting – designed for years of use. All platforms are shipped with detailed instruction for quick and easy DIY assembly. There are no sharp or dangerous corners or edges. Any damaged or broken sections can be easily replaced with minimum loss of time. The modular nature of the structures allows clients to modify the structures if they wish. The smaller pool platforms can easily be removed from the water and stored. The larger platforms are designed to be left in the water. To eliminate the possibility of kids swimming underneath the platform in an unsupervised swim activity, a special “closed” version is available which includes side panels to completely enclose the platform. TOES IN THE WATER – Once the children are comfortable with the general idea of being in/around water, they can sit on the edge of the platform and dangle and kick their feet in the water. As they become more comfortable with being surrounded by water, they can slowly and gradually be encouraged to immerse themselves in the water and hold on to the sides of the PoolDocks platform. Eventually they can move away from the platform but with the knowledge that it’s there for them to come back to. SPLASH WITH FRIENDS – While children proceed at their own speed, they also like to try new things and are motivated to progress so that they can safely participate in all types of fun aquatic activities with their peers and siblings in pools, waterparks and lakes. For more information visit our website http://www.pooldocks.com.